Borrowing from Romare Bearden’s aesthetic palette and inspired by his Odysseus series, Bearden’s Odyssey gathers, for the first time, poems from thirty-five of the most revered African diaspora poets in the United States. Poetic echoes come forth in themes of inspiration with historical intersections of one of the greatest visual artists of the twentieth century. The award-winning editors, Kwame Dawes and Matthew Shenoda, assemble an esteemed literary congregation, with original poems by Chris Abani, Rita Dove, Lyrae Van Clief-Stefanon, Ed Roberson, Aracelis Girmay, Yusef Komunyakaa, and more. 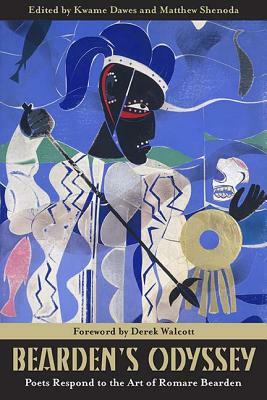 With a powerful foreword by Nobel laureate Derek Walcott and stunning visual reproductions of select Bearden masterpieces, this anthology fuses art and literature, standing as a testament to Romare Bearden’s power and influence in the contemporary artistic world. KWAME DAWES is the author of nineteen books of poetry and numerous books of fiction, criticism, and essays. His most recent collection, City of Bones: A Testament will appear in 2016 along with Speak from Here to There, a cowritten collection of verse, with the Australian poet John Kinsella, and A Bloom of Stones, a trilingual anthology of Haitian poetry. He is Glenna Luschei Editor of Prairie Schooner and Chancellor’s Professor of English at the University of Nebraska, as well as a faculty member of Pacific University’s M.F.A. program. He is the director of the African Poetry Book Fund and artistic director of the Calabash International Literary Festival. MATTHEW SHENODA’s debut collection of poems, Somewhere Else, was named one of 2005’s debut books of the year by Poets & Writers magazine and was the winner of a 2006 American Book Award. He is also the author of Seasons of Lotus, Seasons of Bone and, most recently, of Tahrir Suite: Poems, winner of the 2015 Arab American Book Award. Shenoda is the Dean of Academic Diversity, Equity, and Inclusion and Special Advisor to the President at Columbia College Chicago where he is currently Associate Professor in the Department of Creative Writing. He is a founding editor of the African Poetry Book Fund.